Vegetable oil - 3 tbsp. Heat oil in a pan. Crack the eggs and fry to make omelettes. Now place the fried omelettes over the pizza base which is readily available in the market. Now spread pizza sauce over the omelettes. Now sprinkle salt, black pepper, chilli flakes and oregano. After this add the onion, capsicum and mushroom pieces. Lastly, add the grated cheese. Cover the mouth of the pan and cook on low heat for 7-8 minutes. Ta-da! !- Egg pizza ready! Vegetables used for salads with chicken should be fresh and crunchy. To make the salad look attractive, remember to cut the vegetables, fruits and chicken-- all in the same shape and size. When you boil chicken for salads, preferably take chicken with skin as this keeps the chicken moist. After boiling, the skin is discarded and the chicken is flaked to get shreds. The dressing can be prepared well in advance but the vegetables and chicken should generally be tossed together in the dressing just a little time before serving. This keeps the salad crunchier and fresher. 2 hard boiled eggs and lettuce leaves to garnish. Squeeze the pineapple slices well to remove the excess syrup. Chop into small pieces. Add shredded chicken and chopped pineapple to the mayonnaise. Mix. Taste and adjust the seasoning if needed. Add more pepper and mustard if required. Arrange lettuce all around a shallow dish. Pour the salad. Garnish with hard boiled eggs cut into circles into four. Kick start your party with sizzling kebabs and tikkas that everyone will enjoy.Tikkas & kebabs are easy to prepare at home if certain tips are followed. 1. Marination of tikkas is very important, it tenderises the meat. The longer the marination, the shorter the cooking time. 2. Raw papaya acts as a tenderiser. If the marination period is short, grind 1" or 2" piece of papaya to a paste and apply on the pieces for 1/2 hour before 1st marinade and scrape it off 1/2 hour. (too much papaya and for a long time makes the meat mushy). 3. 1st marinade is to infuse flavour. 2nd marinade is the coating. 4. Always pat dry the pieces before the 1st marinade and gently pat dry after the1st marinade. 5. The 2nd marinade should be thick enough to coat the pieces. 1. Mutton should be washed before mincing. 2. Mutton should be well dried and then minced. Thus it should be absolutely dry before grinding. 3. If ready mince (keema) is used in making kebabs, place it in a sieve and gently press to squeeze out excess water. Do not wash it under running water. 4. Kebabs should be shallow fried on a tawa. 5. If kebabs break while frying, add 2-3 tbsp of beaten egg to the mixture. Here are a few recipes of tikkas and kebabs which you all would definitely like. 1/4 tbsp garam masala or tandoori masala, salt to taste. 1. Wash and pat dry chicken pieces on a kitchen towel. 3. Discard the hard stems of spinach and chop. Wash under running water. 4. Place the spinach in heavy bottomed pan. Cook on medium heat in its own water, stir still the spinach is little mushy. Cool. Squeeze out excess water. 5. Blend spinach, mint, coriander and green chillies to a smooth paste. 6. In a bowl mix spinach paste, curd, cream, cornflour, garam masala and salt. 7. Remove chicken pieces from the 1st marinade. Pat dry gently. Add to the spinach marinade.Marinade for 6-8 hours in the refrigerator. 8. Heat gas tandoor or oven to 200 degree C.
9. Skewer the tikkas or place them on grill rack. Roast for 8-10 mins. Baste with oil or butter once in between. Cook till the pieces are tender. 10. Garnish with lemon wedges and onion rings and serve hot. 1. Place the mince in a strainer. Press out the excess water. 2. Heat oil in a kadhai and deep fry the onions till golden brown. Drain with a slotted spoon and cool. 3. Blend the browned onions, ginger, garlic, cashewnuts and drained khus khus to a smooth thick paste. 4. Put the mince, onion paste, garam masala, chilli powder and salt in a mixer blender. Blend thoroughly to get a sticky consistency. Remove the mixture in a bowl and keep aside. Refrigerate for atleast 2-3 hours. 5. Preheat the oven to 200 degree C or heat the gas tandoor on gas. 6. Shape the mince mixture around the skewers. 7.Roast in the tandoor or oven for 10-15 minutes. Baste with little butter or oil in between. 8. Remove from the skewers, sprinkle lemon juice and chat masala. 9. Garnish with onion rings, chopped mint or coriander. Serve hot. Place the mince in a strainer and squeeze out excess water. Heat 1 cup oil in a kadhai and fry the onion till golden brown. Remove from oil with a slotted spoon and grind to a paste. Place the mince in a mixer blender. Add the brown onion paste, ginger garlic paste, egg, salt, chilli and garam masala. Blend to get a sticky consisency. Remove in a bowl. Heat a non stick pan. Add the besan and roast on medium heat till light brown. Add roasted besan to the mince mixture. Add the chopped coriander also. Keep aside for 1-2 hours or till frying. Heat oil in a shallow pan. Shape the mince into flat tikkis. Shallow fry on medium heat till brown on both sides. Garnish with onion rings and a mint spring. Biryanis, Pulaos and Fried rice prepared with chicken are complete meals by themselves. A bowl of raita is a welcome accompaniment to biryanis or pulaos.Of course they taste great when taken as a part of a meal too. Good quality long grain rice, like basmati rice should be used. 8-10 flakes garlic- chopped finely or crushed to paste. 1. Prepare bouquet garni by tieing all the spices together in a muslin cloth. 2. In a pressure cooker, add the chicken pieces, 5 cups of water, garlic, salt and bouquet garni. 3. Close the lid and give one whistle. Lower the heat and simmer for 1min. Remove from heat. Drop pressure by putting cold water on the lid. Open the lid. 4. Strain, Keep the stock and chicken pieces seperately. 6. Heat oil in a heavy bottomed pan. Reduce heat. Add shah jeera, tejpata and chhoti illaichi. 7. Wait for a min. for the aroma to emit. Add the onion slices. Fry tillgolden brown. 8. Add the chicken pieces along with chopped garlic. Stir fry. 9. Add the mint. Bhuno for 1/2 min. 10. Add 4 cups of stock. Give it a boil(check and adjust the salt). It should be strong as rice is going to absorb salt. 11. Drain and add the soaked rice. Give it a boil and cover the lid. 12. Keep a tawa on fire and put the rice pan over it. Keep something heavy on the lid. Reduce heat. 13. When all the water in the pulao is absorbed and the rice is nearly done, shut off the fire. Leave on the hot tawa till serving time. 14. Serve hot with tomato- onion raita. This recipe though continental in origin will be relished by the Indian palates as it has been wonderfully twisted, keeping the Indian taste in mind. All ingredients used are easily available and the recipe is quick and simple to prepare. 1. Melt butter in a heavy bottomed pan. Add onion and cook till it turns transparent. 2.Add mushrooms.Stir for 2 mins. 3. Sprinkle maida. Stir continuously for a minute on low flame. Remove from fire. 4. Add the milk, stirring continuously. Return to the fire. Cook, stirring continuously till it coats the back of the spoon. 6. Add chicken and simmer for a minute. 7. Add grated cheese. Remove from heat. 8. Transfer to a baking dish. 9. Just before baking, sprinkle bread crumbs. 10. Bake for about 20-30 mins in a hot oven till the dish gets browned. 11. Serve hot with buttered toasts. This recipe is an eye-opener for sceptics who think that a microwave oven is used only to reheat food and at best can cook Continental dishes. Microwave oven saves time and labour, more so if you are busy pursuing a career of your own.It allows you to relive the joys of cooking without the drudgery. This recipe is not overly greased and spicy and sits well in the stomach. 1. Place cauliflowers with 1/2 tbsp of salt and 1 cup of water and microwave for 5 mins at 100% power for blanching. Drain and wash in cold water. 2. Marinate with lime juice and salt and keep it aside for 15-20 mins. 3. Place oil, grated onions and ginger garlic paste in microwave safe bowl and microwave for 5 mins. at 100% power. 4. Add tomato puree, red chilli powder, turmeric powder, garam masala and salt. Microwave for 4 mins at 100% power. 5. 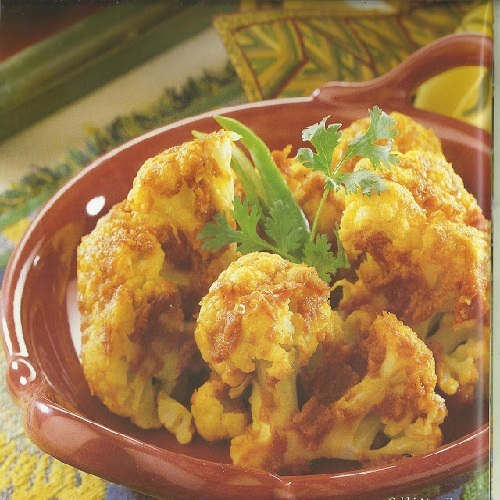 Fill masala in the marinated cauliflower with the help of a fork. 6. Place cauliflower with rest of masala in baking tray in preheated oven in combi cook for 10-15 mins. till top layer becomes brown. 7. Garnish with coriander leaves . Serve with parathas/nan. Today when I woke up in the morning I could not hear the birds chirping and people talking to each other. I went to the verandah. The weather seemed perfect for the beginning of a good mood. It was not actually a hot and sultry morning but a pleasant one. To me it was a day which was perfect for a holiday. Slowly I settled down to my daily chores.Nature suddenly seemed to change. The change of atmosphere was so sudden that I became too astonished to speak when I saw the clouds floating above the roof tops. It was morning but the sky became very dark and there was a strong gale. The trees began shaking vigorously. A heavy downpour started which continued for an hour. After the rain stopped the wind became gentle. The weather reminded me of my childhood days. My mother's deliciously cooked Khichudi, getting wet in the rain with friends while coming back from school. Childhood days are gone but still today is a rainy day. This is a day of having pakoras with hot tea or coffee. So I am posting a few crunchy pakora recipies.Hope you all would enjoy. grind all the three types of dal and add chopped green chilli, onions, salt, powdered rice, ginger paste, red chilli and cumin powder. Mix them nicely and deep fry them on oil in the shape of pakoras. Cut the boiled eggs in round shapes. Now make a batter with besan, onion and chilli paste, fennel seed paste, powdered rice, baking soda and water. Dip the egg pieces in the batter and deep fry them. Serve hot with chat masala. Make a paste with besan, cumin powder, r. chilli powder, salt, baking soda and water. Now grate the cheese cubes and mix with the grated garlic. Keep it in the fridge so that the cheese and garlic mixture hardens. After a few hours make the mixture in the shape of small balls and deep fry till golden brown. Make Small Pieces of Mutton and marinate it with a little bit of tumeric , bit of salt and 1 tbsp mastard oil. Take 3 tbsp of masrad oil and gradually put onion paste , ginger paste,tumeric powder and green chile and fry it until deep red. Put the diced marinated mutton and put salt to taste and cook it for 5-7 minutes. Add tomato and cook it until its watery and mixes up well in gravy. When the mutton is softned enough and red colored, put 1 cup of water onto the pan and cook it in medium seam in covered pan. When the water will get dried up a bit , put the chopped onions and recover with water and cook it for 5-10 minutes in low sim. Take the mutton out of the pan and serve hot with rice/paratha. Take little bit of water in a mixer grinder. Take aroud 50 gms of Posto Poppy seeds (Khaskhas/Posto) ~ 5-6 heaped tbsp of the Poppy seeds paste or posto bata (finely grinded posto into paste) and mix it . Take 500 gms (4-6 nos) of Alu (Potatoes) and cut in small square shape and pre-boil for 5 minutes in a microwave/12 minutes in bowl. Take litlle mustard oil (1/2 table spoon) in a frying pan preferably non-stick skillet and fry the cut potatoes until golden red ans seaparely in into a bowl. Take a liitle bit of oil and once heated , add all the ingredients of paanch phoran as stated above. Add 1/2 cup chopped onion and saute it to golden brown.Add ginger-garlic paste (1 table spoon) and saute it for 2-3 minutes.Add 1/4 tea spoon each of turmeric powder, corriander powder, red chilli powder, salt and water. Then , take the earlier grinded paste form of posto , salt to taste and saute it for 10 minutes in medium heat. Put in 1/2 cup of water and keep it cooking in covered for 2-3 minutes. Once the water and condiments gets soaked in and it is geeting semi dried up , take it oy for serving.